A girl points at word north at the official web site of Macedonian government with country new name Republic of North Macedonia in Skopje, Macedonia, Feb. 12, 2019. A government press release said the young country now is formally called the Republic of North Macedonia. A series of practical adjustments -- ranging from new road signs to updated passports and currency -- will be made gradually, and started with the government website late Tuesday. Prime Minister Zoran Zaev said his country would press ahead with all the changes needed to fulfill its end of the historic deal he reached with the prime minister of Greece last year. "At the end of the day we must show that we are implementing our part of the obligations," he said. "I believe that all institutions are ready to act." Foreign Minister Nikola Dimitrov said the move followed a final exchange of diplomatic notes with Greece. "May today be the beginning of a long friendship between Greece and North Macedonia," he said in a tweet. "We can't change our past, but we can and we will shape our future of friendship, partnership and cooperation." The name change resolves a dispute with Greece dating back to Macedonia's declaration of independence from the former Yugoslavia in 1991. Athens had long argued that its small, landlocked neighbor's name implied claims on the northern Greek province of Macedonia, and on ancient Greek cultural heritage. Although more than 130 countries formally had recognized the country as Macedonia, the United Nations and other international bodies used the "Former Yugoslav Republic Of Macedonia," the cumbersome moniker Greece and Macedonia settled on for an interim accord in 1995. FILE - Greek Prime Minister Alexis Tsipras and Macedonian Prime Minister Zoran Zaev gesture before the signing of an accord to settle a long dispute over the former Yugoslav republic's name in the village of Psarades, in Prespes, Greece, June 17, 2018. A breakthrough in their name dispute came last summer when Zaev and Greek Prime Minister Alexis Tsipras agreed to a compromise under which Greece also lifted its objections to Macedonia joining NATO and the European Union. North Macedonia's deputy foreign minister, Andrej Zernovski, told local Telma TV that authorities would change, within three days, road signs at border crossings, airports and customs checkpoints. Within four months, the Interior Ministry will start issuing new car license plates with the abbreviation NMK, while new passports will be issued at the end of this year, Zernovski said. The country plans to give the U.N. and its member states formal notice of the name change within days, he said. A government press release said that changes will also be made to notice boards at airports, while the country's central bank will draft plans for replacing the circulating currency with the old one-word name. 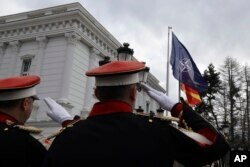 Macedonian soldiers salute as the NATO flag raising in front of the government building during a ceremony in Skopje, Feb. 12, 2019. Earlier Tuesday, Macedonia raised a NATO flag at its main government building, as more member nations approved making it the alliance's 30th member. Speaking at a ceremony in the capital of Skopje, Zaev said the country had achieved a "historic goal" in being accepted into NATO. All of NATO's 29 current members must ratify the accession agreement. Slovenia on Tuesday became the second country to do so after Greece, which made the move last week.